A school kid will eat about 2500 lunches - let's make them great! A really bad thing happened in Term 4. The kids went to my parents for a school-night sleepover. What I was really looking forward to, more than the party I was going to, more than the minor sleep-in the next morning, was the fact that I’d get a day off the school lunches. My mum rang at 9.15am to report a successful drop-off. Except for one thing. A lunchbox remained on their kitchen bench. “Ah, that’s OK, I’ll run something down,” I said, sinking into a dire mire of carrot sticks and crackers. So much for my break from this particular drudgery. An Australian child needs about 2500 lunches to get them through 13 years of school. I’d rather not greet each day with dismay. So this year I’ll be more organised, keep the lunches fun and healthy, and get my kids more involved in making their own. And it won’t matter when they say the dread words (“I hate sandwiches”) because they do like chicken lettuce cups, un-sandwiches (bread with the filling on the outside), sushi shapes and other stuff. It’s all about making my mornings manageable and keeping their tummies sated and brains concentrated throughout the day. Snacks include ‘ants on logs’ (celery with cream cheese and currants), peeled carrots, cherry tomatoes and fruit. I’d love to add baby cucumbers to that list because I think they’re great but my children are staunchly opposed. I steer clear of packaged, processed snacks but I’m not opposed to treats. 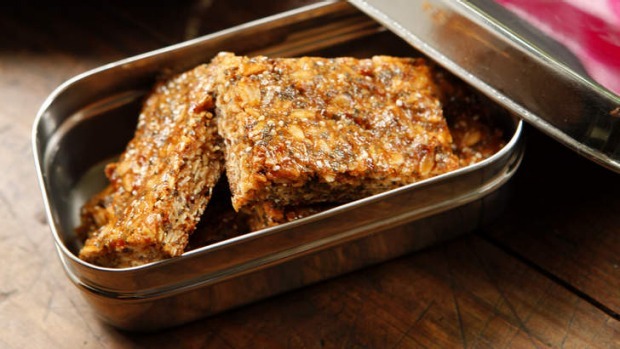 The kids might get a granola bar (recipe below), a biscuit or piece of cake, or a few squares of chocolate. This picnicky version of san choi bau is healthy, crunchy and energising not to mention gluten-free. This quantity will last two children for approximately three days. The chicken makes great sandwich filling too. 2. 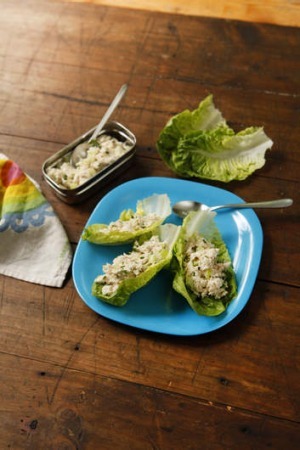 Separate cos lettuce leaves and send a few pristine scooped leaves to school, along with chicken filling in a container, a spoon and a cold pack. When I first saw rice shapes like this (but much fancier) it was on an aspirational Pinterest board that should have been called something like “I’m a better parent than you so ner”. “Ridiculous,” I spat at my screen. Then I realised it’s actually pretty easy to do basic designs. Rice molds and nori cutters are available from Japanese grocers but it’s not that hard to form shapes by hand, or with cookie cutters, and nori can be snipped with scissors. Stuff the rice balls with a morsel of leftover meats, avocado, cooked or raw vegetables, or use more traditional onigiri fillings such as salted plum. 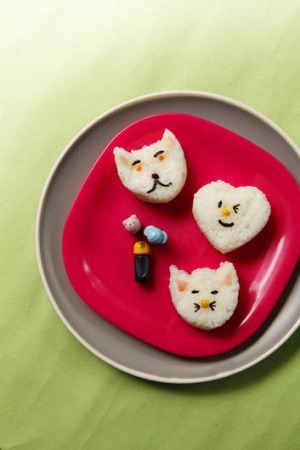 Cook rice according to packet instructions, season with sushi vinegar if desired and allow to cool. When cold, shape rice with a small amount of filling. Commence decorating frenzy. 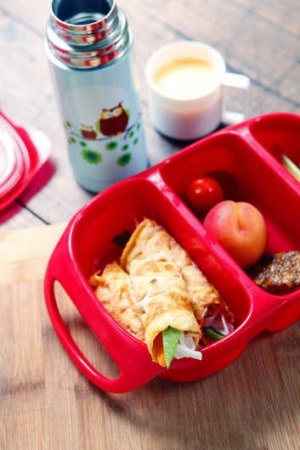 I made these after a succession of rice paper roll lunchbox failures. Rice paper starts off looking great but it’s delicate and the cavalry reported that they fell apart, ripped or stuck together by lunchtime. A thin one-egg omelette is a little sturdier and it’s more nutritious. Other stuffing ideas include tofu, meat and cabbage. This quantity makes one; scale up to suit. 1. Whisk the egg with the soy sauce. Heat the oil in a 20cm non-stick pan over high heat until shimmery. Tip in the egg. Cook for 5 seconds before swirling egg to coat the pan. Cook until puffed and golden on underside before flipping to cook the second side. Again, cook to a deep golden before removing from pan to cool on a plate. 2. Cook rice noodles according to packet instructions. Blanch snow pea for 1 minute (to be frank, I chuck it in with the noodles) then plunge into cool water. Cut snow pea lengthwise into 2 or 3 pieces. Place noodles, carrot and snow pea into omelette and roll up. This is a very basic bread recipe so feel free to add seeds or use wholemeal flour, as preferred. 1. Stir yeast and sugar into the warm water and leave for a few minutes until it becomes frothy. 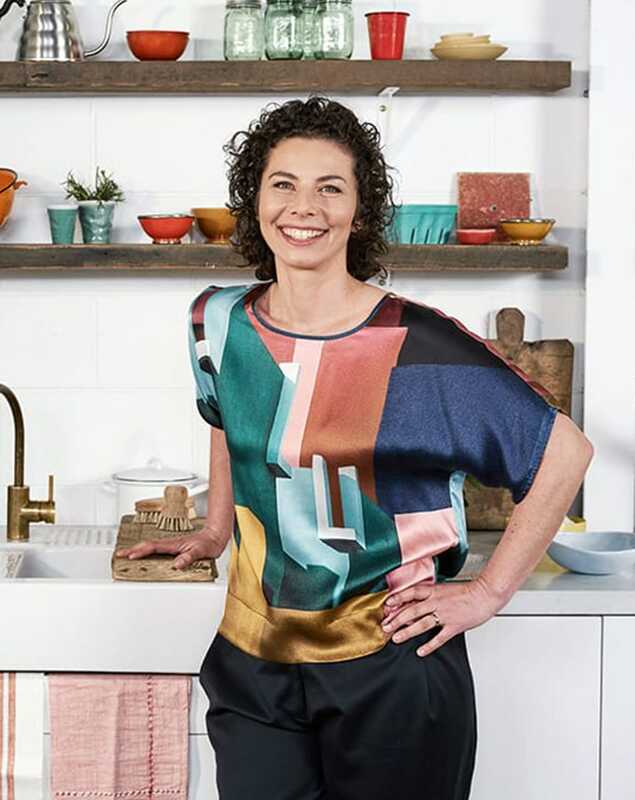 Place the flour into a large bowl or mound it on a benchtop and make a well in the middle. Add the frothy yeast mixture, the salt and the oil. 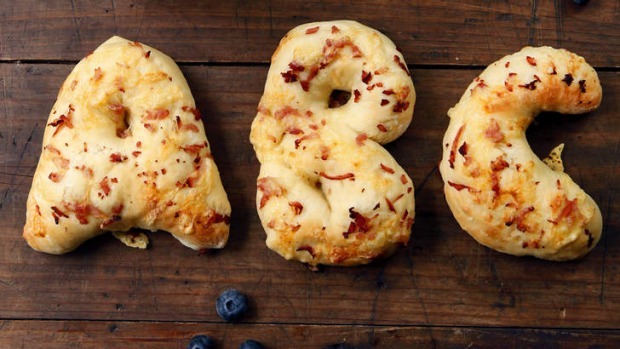 Bring ingredients together then knead for five to 10 minutes until glossy and elastic. 2. Place in a warm place to rise for an hour or so. Punch down and shape as desired. Place on a baking tray covered with a damp tea towel and leave for 15 minutes to rise again. 3. Preheat oven to 200ºC. 4. Sprinkle shapes with water then cover with grated cheese and chopped ham. Bake for 15 minutes, or until the bread is golden brown in appearance and responds with a hollow-sounding ‘tonk’ when tapped. Alternative toppings include chopped garlic, rosemary and olives. This easy wheat-free slice is full of good things and super tasty. Don’t send it all to school with the kids. 1. Preheat oven to 140ºC. 2. Place the butter, honey and brown sugar in a small saucepan and melt, stirring often, until it forms a light, sticky caramel. Add the dates, rolled oats, poppyseeds, chia seeds, cinnamon and salt and stir through until combined. 3. Line a baking tray of about 20cm x 25cm with baking paper and press in the mixture. It’s sticky so I use another sheet of baking paper on top to get it more or less even. 4. Bake for 20 minutes or until golden brown. The slice will be soft when removed from the oven but will set as it cools. Slice into squares and store in an airtight container. 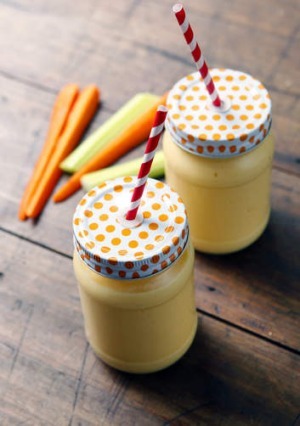 Very cold, icy smoothies last until lunchtime but I tend to make these jar smoothies as an after school treat if we’re heading off in the car to an activity. Makes around 600ml. Place all ingredients in a blender and process until smooth and frothy. Pour into a jar, securing lid to transport. I polled a posse of primary school children on school lunch fails – things that went soggy and splatty were the biggest gripes. “Cheese goes gross and slimy when mixed with tomato,” says Buster, 11. “I don’t like squished tomatoes because they splat all over my lunch box,” says Atticus, 9. “Sandwiches get a bit boring, alfalfa sprouts are disgusting, ham gets warm and avocado goes gross,” says Hazel, 11. “Corn Thins go soggy if you put something on them so I take them plain and put stuff on at school,” says Eva, 9. “Avocado and lettuce go yukky and brown, and mayonnaise or tomato sauce go everywhere and they’re not very nice when they get hot,” says Daniel, 10. Recipes first published in The Age, Good Food. I wrote this story two years ago but with my kids about to head back to school, I started thinking about a year of great lunch boxes and thought it was worth revisiting. What are your lunchbox loves, loathes or tips? Let me know below, I’d love to hear from you!